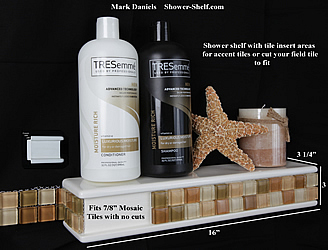 Bathroom Tile Shower Shelves & Recessed Shampoo Niches Email me! 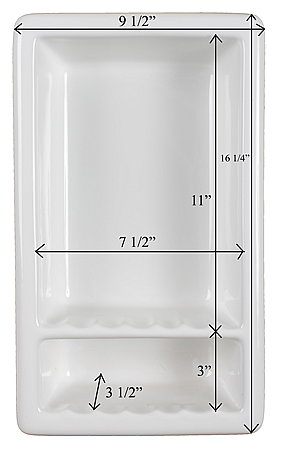 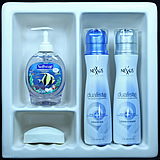 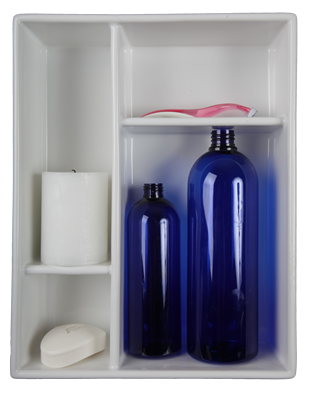 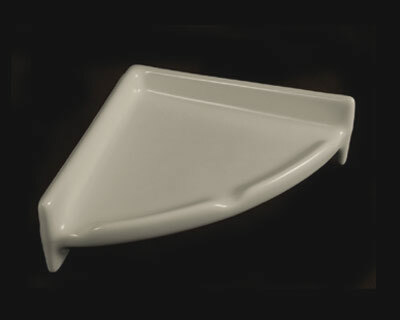 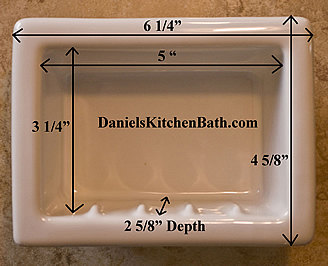 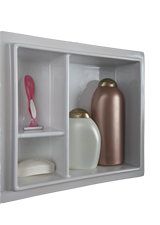 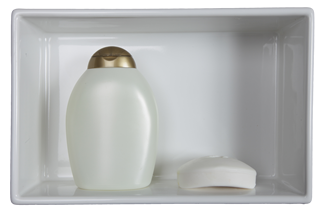 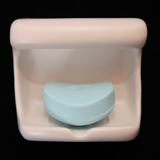 Shower-shelf.com offers easy to install and easy to clean one piece recessed ceramic niches for your bathroom toiletry storage needs. 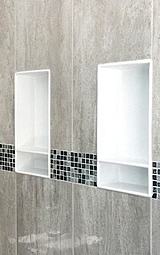 Our stoneware ceramic niches are designed to fit standard size tiles without cuts to make installation simple. 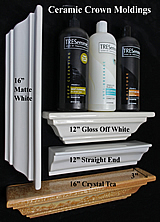 Our niches are much easier to install than tiled niches and results are clean and predictable. 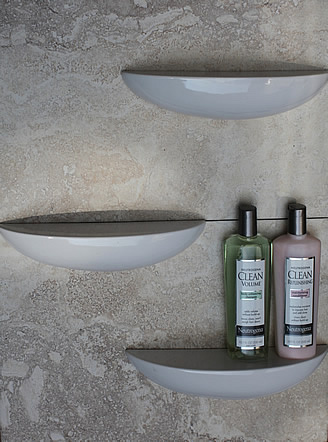 We have the Easy Install series and the new Cleanline series that will make your bathroom remodeling project a success. 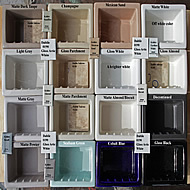 We offer service as part of our sales with help in making color choices, installation questions and color service. 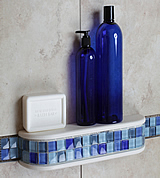 Send us a piece of your tile for color comparisons, see Niche Color Choices web page for details. 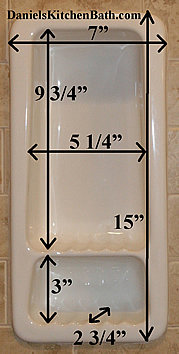 Many of shower shelves and niches can only be found here as I have designed, fabricated and manufacture them myself. 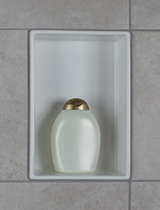 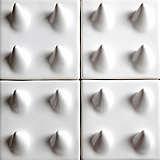 All are quality porcelain or ceramic fire glazed clays made to last a lifetime, are easy to install and easy to clean. 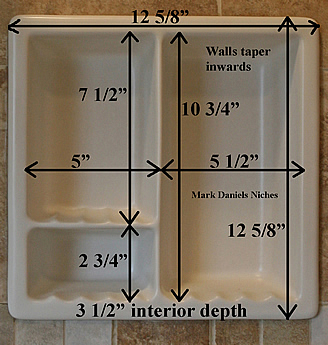 The large niche in the middle is the best value and also easily fits between the framing. 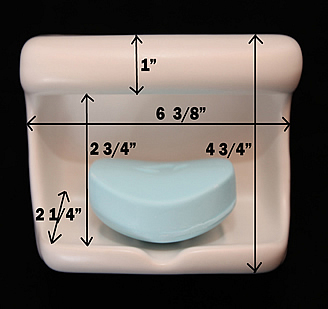 All available colors are listed in the drop down by the item, if not listed we don't have it in that color. 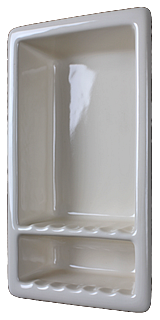 Color Variation is inherent in ceramics, dye lots, location in kiln including temp, lighting, monitor calibration and the human eye all enter into how a color is perceived! 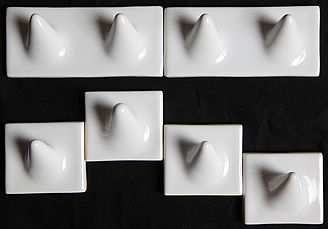 Plan on ceramics not matching perfectly! 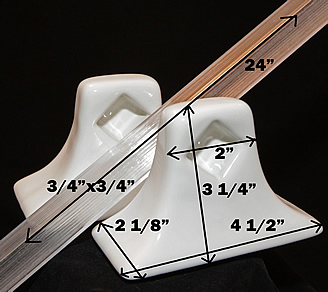 We will be running out of certain items and colors because one manufacturer is closing their business, but we will have new improved items to replace these in the coming months. 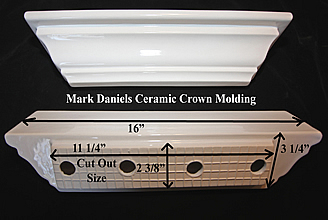 All openings are approximate as ceramics firings vary, its close. 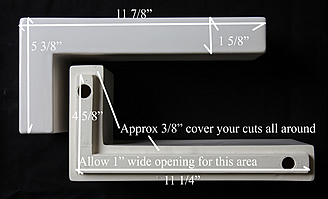 10 3/4 x 2 3/4"
Don't use regular duct tape or masking tape as they will not hold. 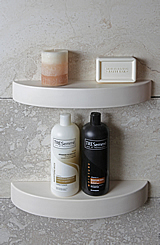 Also use GE silicone 2 bathroom caulk or equal for the mounting and caulking of niches or shelves. 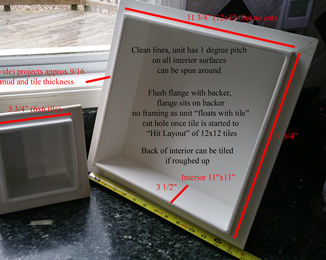 Attaches to backer board with thinset, covers the tile cuts. 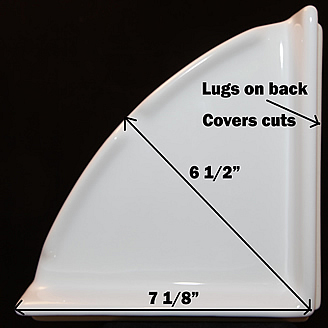 Seal your corners so if they open up water will not get through! 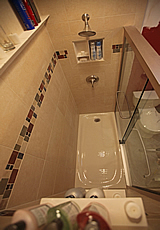 With 40yrs remodeling bathrooms, the first place to crack are the corners. 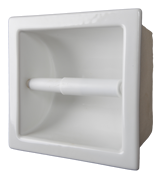 Also silicone your valve escutcheon and spout well. 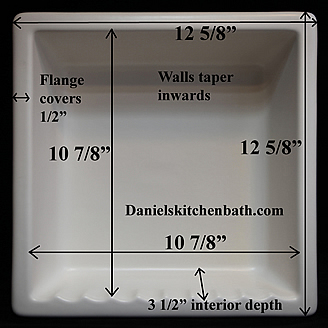 Tile to "bead" and over flange, flush with backer board. 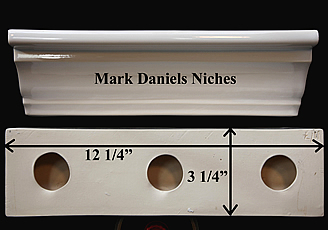 No bull nose needed. 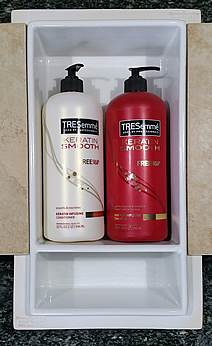 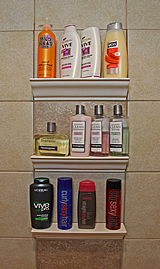 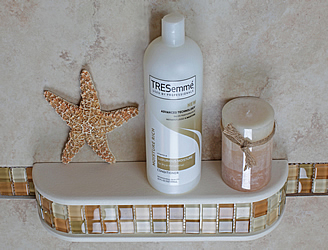 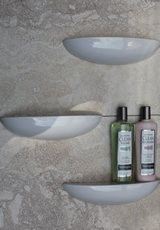 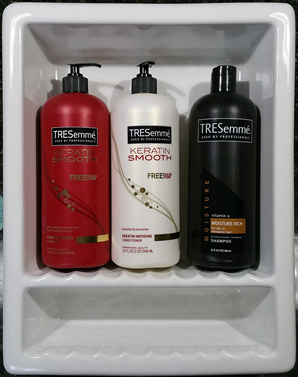 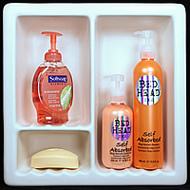 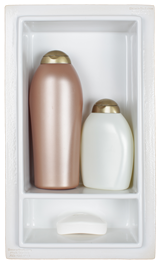 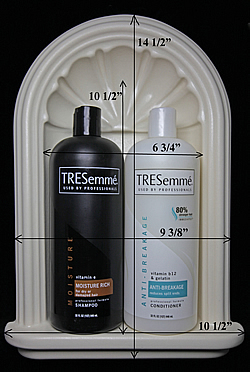 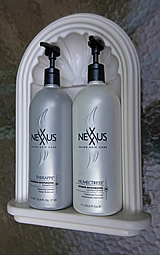 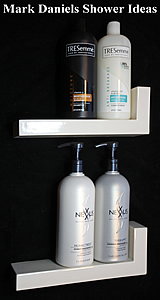 This shampoo shelf can be mounted vertically or horizontally, 1 degree slope on all sides. 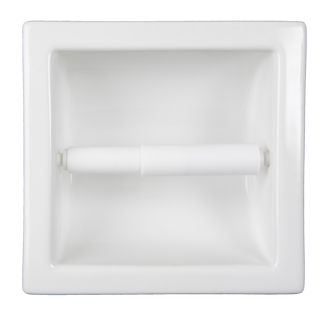 Cleanline Large 2 compartment 8" x 15"
Set with thinset and silicone caulk neatly in. 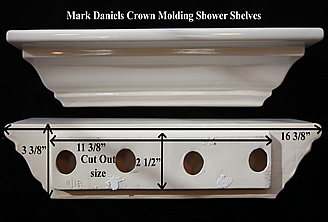 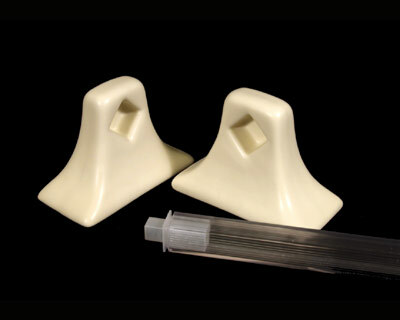 Mitered Ceramic Crown Molding 16"
Attaches to backer board with thinset, covers the tile cuts..
Cut out approx 5 3/4 x 5 3/4"
Mounts on backer board and over tile cuts! 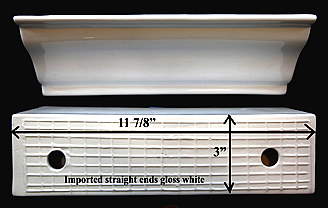 Can cut plastic bar to desired length! 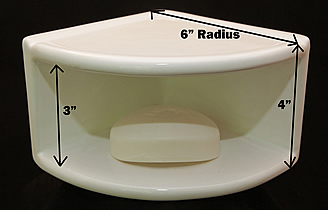 7 3/4" x 13" with 7 3/4" diameter circle at top. 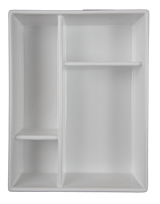 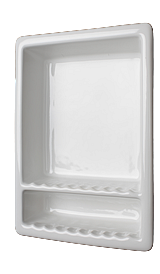 Modern square insert shelf 16"
16"= 15 1/4" x 2 1/2"
We only have gloss white! 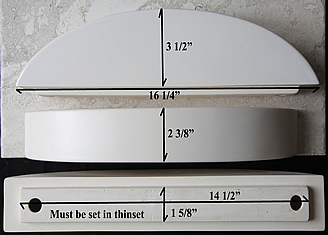 Modern rounded insert shelf 16"